All swatches were taken indoors under a combination of Cree daylight and LED bulbs using a Samsung NX300 camera. Also, all swatches are topped with KBShimmer Clearly On Top Quick Drying Top Coat which is AWESOME! For Fox Sake is a dusty red leaning orange (think muted coral) creme. Shown here is two coats plus top coat. Everything about this polish is fantastic! I am obsessed with the shade of this polish – not to mention, the name is awesome! Smoke Signal is a smokey light grey crelly with orange, red, and aqua holographic hex, square, and micro glitters. Shown here is two coats plus top coat. This polish is quite easy to apply and levels really well. The only downfall I found in this polish is that the glitters move around more than I’d like during application. To counteract this, I applied the coats with as little brush strokes as I could. I really how the contrast of the glitters against the grey base gives resembles a smoke effect. I love how the glitters barely peek through – it’s like they really are caught in smoke! The micro metallic flakes are to die for! Kind of a Big Dill is a deep forest green jelly filled with silver and holographic glitters of various shapes and sizes. Shown here is three coats plus top coat. This polish was opaque in two coats but I added a third to darken the jelly base. I love this polish so much! It’s so perfect for the holidays. Definitely one of my favorites! How Corn-y is an Indian corn inspired yellow beige crelly with burgundy, gold, red, and orange glitters. Shown here is two coats plus top coat. 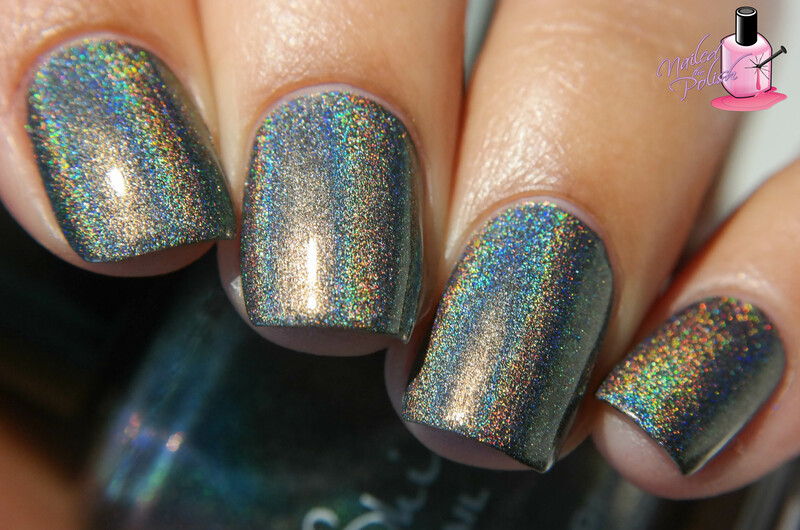 Another crelly that’s packed full of glitters! Even with all of the glitter, it is really easy to apply and control. This polish totally reminds me of a cornucopia – so fun and great for Thanksgiving! Owl Miss You is a soft beige neutral tan crelly with slight grey undertones plus added golden and coppery metallic flakes and iridescent shimmer. Shown here is three coats plus top coat. Super easy to control, dries quickly, and levels really well which makes reaching opacity a breeze. This is another polish that is super unique! 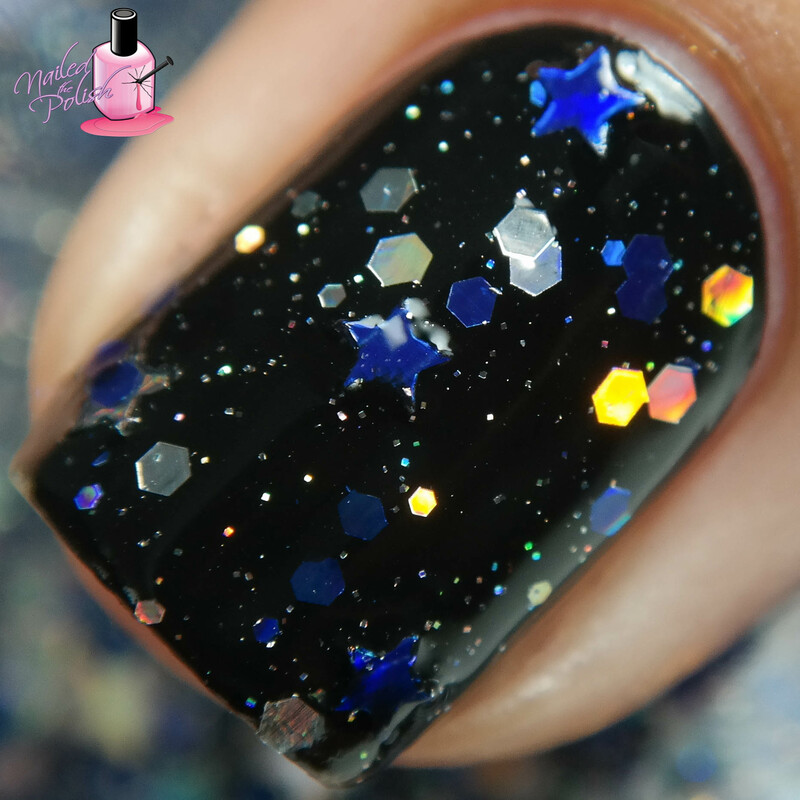 There are so many elements packed into this polish that surprisingly work very well together! So much depth everywhere you look! You definitely don’t wanna miss out on this polish! Toying Around is a clear base glitter topper filled with a rainbow of colorful matte glitters in stars, squares, circles, triangles and hexes plus micro silver holographic throughout. Shown here is one dabbed coat over For Fox Sake plus top coat. As you can see from my swatch, this polish is packed full of glitters! You do have to fish for some of the larger glitters but since there are plenty of others to grab your attention, it’s not a big deal (or should I say big dill? 😉 lol). Toying Around is the 2015 charity polish and $4.00 USD from each bottle of “Toying Around” will be donated to Toys for Tots! This glitter topper is so adorable! This is one night sky I would love to make a wish to! sELFie is a holiday holographic glitter with green, red, gold and silver holographic hex glitters in a clear base. Shown here is two coats (one brushed and one dabbed) plus top coat. This polish can easily be used as a glitter topper but the Christmas obsessed side of me came out and wanted it all over mah nailssssss! Seriously, if this isn’t Christmas in a bottle then I don’t know what is! Love. This. So. Much! The subtle holo and iridescent flakes are so perfect! I just want to cuddle it! Claws and Effect is dark purple leaning navy linear holo blue to pink shifting glass flakes. Shown here is two coats plus top coat. Amazing formula – so smooth, so buttery, so creamy! I could apply this polish all day long and not ever complain! This is a shade that’s great to wear during winter. I’m really digging the deep navy tone and added shifting glass flakes! Last up is Coal in One – an intense charcoal grey linear holo. Shown here is two coats plus top coat. Coal in One is a must have! The formula, the intense holo, the charcoal grey base – perfection! When I first laid eyes on this polish, I knew it would be one of my favorites and I was right. This polish is everything! This is a piece of coal I definitely want in my stocking! What a great way to start the Winter season reviews! I love how there is something for everyone – cremes, crellies, jellies, glitters, holos – it’s all there! You have your traditional festive polishes (like sELFie and Oh Holo Night) and some not so traditional (like Yule Worthy and Owl Miss You) which makes for a nice range of colors and styles to choose from. Formulas are wonderful and any issues I had were minimal. This collection is available for purchase here. Polishes range from $7.50 USD to $8.75 USD each. Be sure to take a look at the other items KBShimmer has for sale including mani shots, water decals, nail vinyls, hand lotions, and my fave – rainbow finish tools! You can check out KBShimmer on Twitter, Facebook, and Instagram for more! What are your thoughts on this collection? Which polishes are your favorites?